It fits pak64.german because it's original german building. 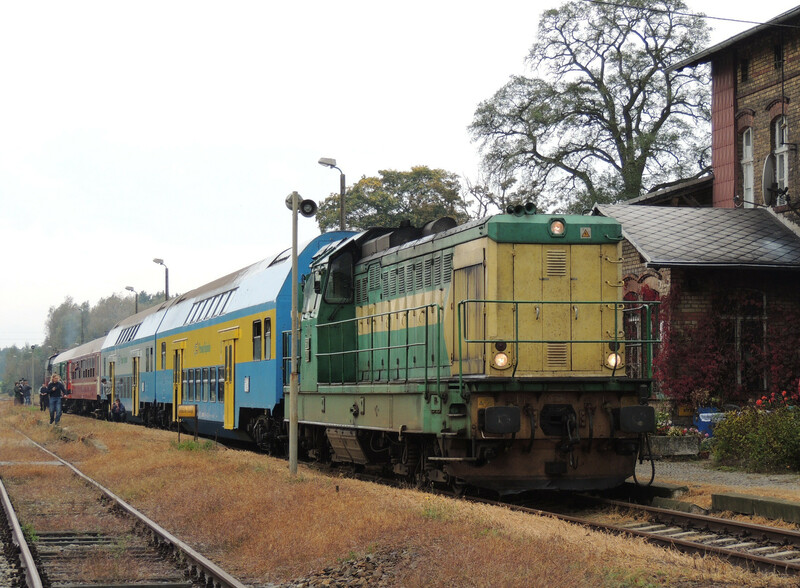 A new loco for Simutrans: polish diesel SU45. It's called "Fiat" because of its motors were licensed by Fiat. SU45 were produced between 1970 and 1976. Power: 1250 kW, weight: 102 T, top speed: 120 km/h. Fiats are used mostly for passenger trains, rarely for cargo. Those Vehicle looks very good out. Those vehicle came often over the border from Poland to germany drive. Until in Frankfurt Oder came the Electricvehicle. How does it works? Like depot? From the .dat file you can see it is a station-tile, where trains can stop. The Turntable looks very good out. It do pass in the pak.german too. The buildings are very nice. From 70's 80' block houses? Thank you for the info that the building out the 80's it. Here comes a revenge... Ceaușescu's Revenge! 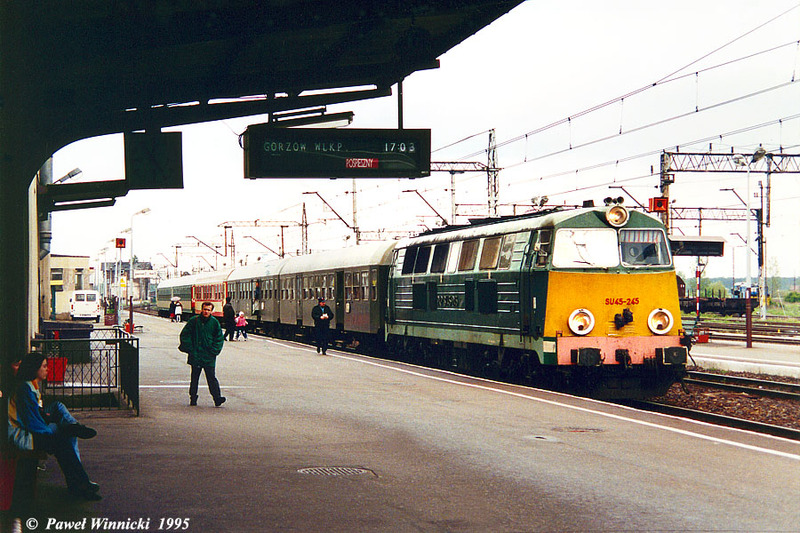 It's romanian FAUR LDE1300, in Poland officially named as SP32, also known as "parrot" (because of yellow-green painting), "vacuum cleaner" (because of engine's sound) or "Ceaușescu's Revenge"(because of high unreliability of it's engine). It's weak diesel locomotive used to lead light passenger trains. The SP32 they you have be make looks very good out. I like it. I have a question: Can you use the object resizer? Becouse I don't know how does it work. I would like to resize my pak 128 Hungary creations into pak64 HU_PL just I can not use the object resizer. I'm afraid I can't help you 'cause I just don't know this tool. More vehicles from eastern Europe - this time I give you a trolleybus Škoda 8Tr. They were produced in Škoda works in cities of Plzeň and Ostrov nad Ohří in Czechoslovakia between 1955 and 1961 year. Now we've got passenger trailer for Škoda 8Tr: it's Karosa B 40. I have to resize or repaint few of my models and then finish some old projects... but still have no motivation to start. Maybe thanks to you I will. I can't get any help with this job. Every time I realize I'm alone I have no mood for work. @Levi1208: you can help me and motivate me. Which addon do you want me to finish first? There are a bridge, a diesel loco and a steam loco. You can also contribute - I will send you pictures of an object to finish the task. Well I can't do the dat files, I have zero knowledge about that but instead I can do some nice little graphics... if I have something as a base. So you can finish the bridge. There's only need to draw ramps, icon and cursor. All elements are aligned already.